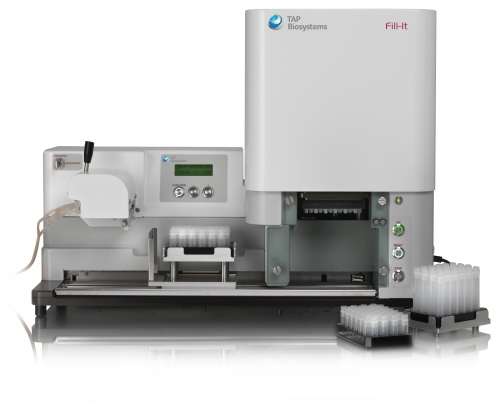 TAP Biosystems has installed a Fill-It, benchtop automated vial filling system at Life Technologies, one of the world’s largest suppliers of cell lines and reagents for life science research. The Fill-It system will be used to improve the accuracy of processing large batches of cryovials and will reduce the risk of staff acquiring a repetitive strain injury (RSI). Scientists at Life Technologies installed the Fill-It to produce a batch of around 2000 cryovials containing a proprietary new product once every three weeks. The product being dispensed into the vials is temperature sensitive so operatives have to uncap, fill and recap vials and put them in the freezer quickly to maintain optimum product quality.